The powerful intelligence operating system of the Google Android that has the version of the 4.1 Jelly Bean. 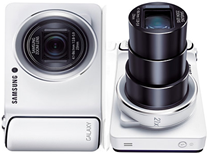 The Samsung Galaxy camera EK-GC100 have a 21 x optical zoom, a pop-up flash, in-camera editing, in-camera filters, 4.77-inch touch display, voice control, HD video capture, a 23 mm equivalent wide angle lens, comes with a range of great and exceptionally awesome and rich professional shooting options and modes. Share photos anywhere with 3G and Wi-Fi, Shoot high-quality pro-style photos easily, Use Android 4.1 Jelly Bean OS and great apps, Edit directly on the camera with built-in tools. Samsung Galaxy Camera 2 comes with 16-mega-pixel BSI CMOS sensor, with a whopping 21 x optical zoom, 4.8-inch touch-screen on the back, 1.6 GHz quad-core processor, 2 GB of RAM, Full HD video, Wi-Fi, Drop-box app with 50 GB of free cloud storage for two years and have 8 GB built-in memory.